Dr. Andrés Cárdenas is a Senior Specialist and Clinical Professor of the Institute of Digestive Diseases and Metabolism at Hospital Clinic and University of Barcelona. He previously held a post of Attending Gastroenterologist and Hepatologist at Beth Israel Deaconess Medical Center (BIDMC) in Boston, USA and Instructor in Medicine at Harvard Medical School. After qualifying from Medical School, he completed his Residency in Internal Medicine at Boston University Medical Center in Boston. During his training he became interested in advanced liver disease, further pursuing a Research Fellowship in Hepatology for 2 years at Hospital Clinic and University of Barcelona in Spain. He returned to Harvard Medical School and Beth Israel Deaconess Medical Center for his Clinical Fellowship in Gastroenterology and Hepatology. He also completed an Advanced Hepatology Fellowship as well as an Advanced Therapeutic Endoscopy Fellowship both at BIDMC and Harvard Medical School. During his training he also completed a Masters in Clinical Investigation at Harvard Medical School and the Massachusetts Institute of Technology. Finally, he also completed a Doctoral Thesis at the University of Barcelona. Dr Cardenas is Board Certified in Internal Medicine, Gastroenterology and Hepatology by the American Board of Internal Medicine. His main expertise and research interests are complications of cirrhosis, interventional procedures in patients with cirrhosis and portal hypertension and biliary complications in liver transplant recipients. He has over 120 publications in peer-reviewed journals and over 70 chapters in medical textbooks and also has recently authored a textbook on Complications of Cirrhosis. He has delivered numerous invited lectures around the globe on topics related to complications of cirrhosis and liver transplantation. 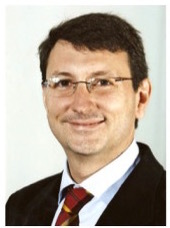 He serves on the Editorial Board of several GI/Hepatology Journals including Liver Transplantation (Associate Editor), Journal of Hepatology, Frontline Gastroenterology (Deputy Editor), Alimentary Pharmacology and Therapeutics, Gastrointestinal Endoscopy, Annals of Hepatology, European Journal of Gastroenterology and Hepatology among others. He is a member and Fellow of the American Gastroenterological Association (AGAF), as well as an active member serving on several committees of the American Association for the Study of Liver Disease, European Association for the Study of the Liver, American Society of Gastrointestinal Endoscopy, and Massachusetts Medical Society. “The field of liver disease has never been so dynamic as it is today, with advances in the understanding of disease pathogenesis, imaging and therapeutics all providing an unmatched opportunity to treat patients who suffer from the complications of cirrhosis. These treatments require careful assessment for efficacy and value and moreover, some interventions such as liver transplantation are only available to a select group of patients. 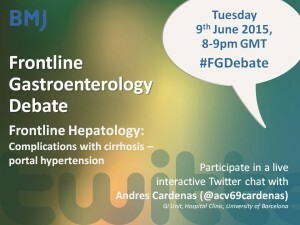 Determining disease prognosis, who should be considered for transplant and how to manage patients that are terminally ill with cirrhosis are challenges faced by practitioners on a daily basis. Cirrhosis is the 12th leading cause of mortality in United States accounting for over 30,000 deaths per year. In addition it accounts for 4 to 5% of deaths for people between the ages of 45 and 54 years in the United States. These numbers are driven by the complications patients with cirrhosis suffer. In addition the economic burden of cirrhosis and its complications are considerable as the estimated national average cost in the United States for treatment ranges from $14 million to $2 billion, depending on disease etiology. Thus a thorough understanding of the diagnosis and management of cirrhosis and its complications are mandatory for the practicing physician. Join us on Tuesday 9th June 2015, 8-9pm GMT for the #FGDebate!